Ruthie Hauge - For Shaw Media Huntley High School Poms Squad dancers, Eliza Godfrey (so.) and Amina Hasan (so.) 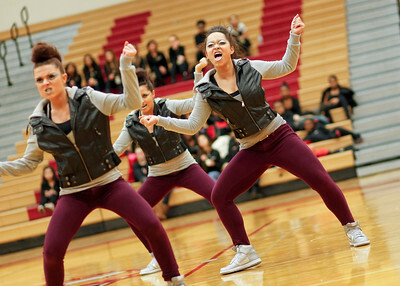 perform with their team during the IHSA Competitive Dance Regional at Huntley High School on Saturday, January 25, 2014. Ruthie Hauge - For Shaw Media Huntley High School Poms Squad dancers, Eliza Godfrey (so.) 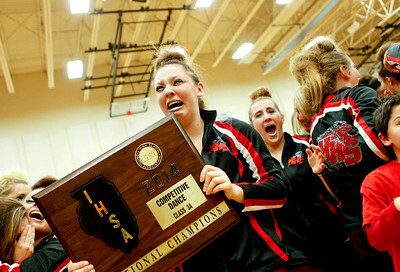 and Rachel Halter (sr.) react after learning their team took first place during the IHSA Competitive Dance Regional at Huntley High School on Saturday, January 25, 2014. 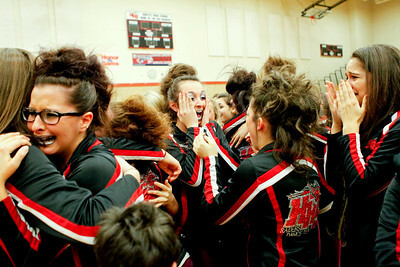 Ruthie Hauge - For Shaw Media Huntley High School Poms Squad dancers, Victoria Oliveira (sr.) and Rachel Grano (jr.) react after learning their team took first place during the IHSA Competitive Dance Regional at Huntley High School on Saturday, January 25, 2014. Ruthie Hauge - For Shaw Media Barrington High School Poms Squad dancers huddle before performing at the IHSA Competitive Dance Regional at Huntley High School on Saturday, January 25, 2014. Ruthie Hauge - For Shaw Media Barrington High School Poms Squad dancers Eva Dockery (sr.) and Melissa Stathakis (sr.) share an emotional embrace after performing at the IHSA Competitive Dance Regional at Huntley High School on Saturday, January 25, 2014. 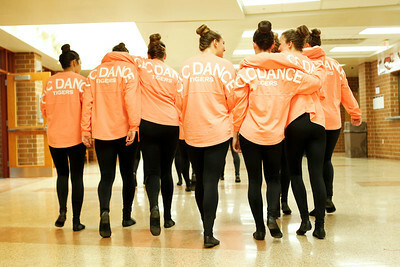 Ruthie Hauge - For Shaw Media Crystal Lake Central Poms dancers walk down the halls of Huntley High School after what they considered a successful dance performance during the IHSA Competitive Dance Regional on Saturday, January 25, 2014. Ruthie Hauge - For Shaw Media Barrington High School Poms Squad dancers Amanda Adams (so.) and Madeline Cremer (jr.) leap into the air while performing a lyrical dance piece during the IHSA Competitive Dance Regional at Huntley High School on Saturday, January 25, 2014. 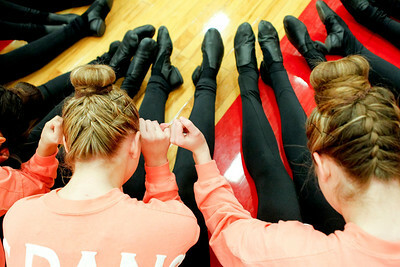 Ruthie Hauge - For Shaw Media Crystal Lake Central Poms dancers lock pinkie fingers with each other as they await the announcement of scores after walk competing in the IHSA Competitive Dance Regional at Huntley High School on Saturday, January 25, 2014. 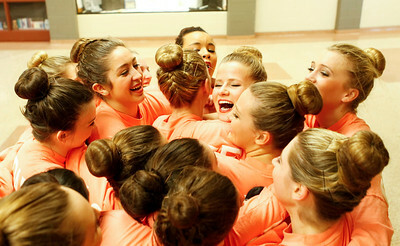 Ruthie Hauge - For Shaw Media Crystal Lake Central Poms Squad dancers hug fellow teammate Allison Beggin (sr) after competing in the IHSA Competitive Dance Regional at Huntley High School on Saturday, January 25, 2014. Beggin suffered an ankle injury, but still competed. Ruthie Hauge - For Shaw Media Cary-Grove High School varsity poms member Jaclyn Walters (jr.), performs with her squad during the IHSA Competitive Dance Regional at Huntley High School on Saturday, January 25, 2014. 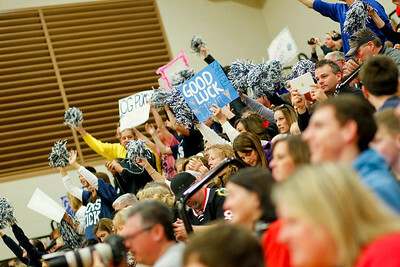 Ruthie Hauge - For Shaw Media Supporters of the Cary-Grove High School Poms Squad cheer as the team takes the floor to perform during the IHSA Competitive Dance Regional at Huntley High School on Saturday, January 25, 2014. Ruthie Hauge - For Shaw Media Cary-Grove High School varsity poms member Haley Pennington (jr.) hugs teammate Riley Dahl (sr) when they learn they are moving on to the state competition at the IHSA Competitive Dance Regional at Huntley High School on Saturday, January 25, 2014. Ruthie Hauge - For Shaw Media Dundee-Crown High School varsity Poms, Taylor Brown (jr.) and Caitlin Tolentino (fr.) perform their dance routine during the IHSA Competitive Dance Regional at Huntley High School on Saturday, January 25, 2014. Ruthie Hauge - For Shaw Media Dundee-Crown High School varsity Poms, Mimi Groch (so. ), Taylor Brown (jr.), Caitlin Tolentino (fr. ), and Kellie Konstantinidis (sr.) perform their dance routine during the IHSA Competitive Dance Regional at Huntley High School on Saturday, January 25, 2014. Dundee-Crown High School varsity Poms, Taylor Brown (jr.) and Caitlin Tolentino (fr.) perform their dance routine during the IHSA Competitive Dance Regional at Huntley High School on Saturday, January 25, 2014.